Many users are looking for ways to increase the newer Windows 10, Microsoft system speed, an advantage exists and there is built into the system could help users in this goal, a Quick Start fast startup feature, which is doing a combination between the closure Shutdown and hibernate Hibernation to provide faster boot. 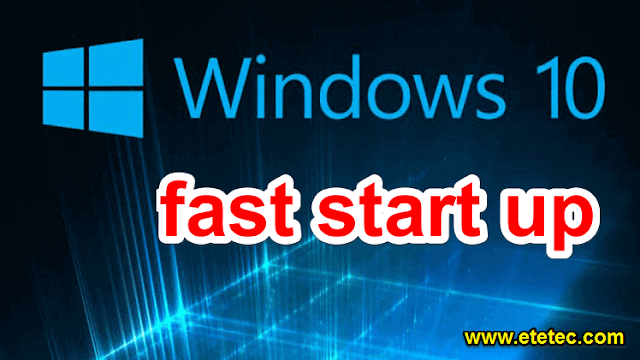 fast startup feature is when you run them by making Windows system stores some system files in Hibernation File, and then when the user closes the calculator completely (Shutdown), and turn it back on, the system uses these files to boot faster, since it is a summary, the feature by making computer lift off from Hibernate file instead of the boot from the start. And require fast startup feature activation Hibernate feature, which is enabled by default, unless the user to disable it manually, which is a case where a computer put some system files where, to be used for take off faster, rather than re-establish these files and settings from the beginning . We will Below lists the steps to activate the Hibernate, and then explain how to activate Quick Start fast startup feature. Click Click the right mouse button Right click on the Start menu button, and select (Command Prompt (Admin, from the pop-up menu, and if the system asks you whether you want to let the program make changes in the device, press Yes, yes. , And then press the Enter button. Open the Start, then click on the Settings button settings. Click on the additional power settings Additional power settings. After opening the Additional Options window, select Choose what the power buttons do, on the left. (Turn on fast startup (recommended, and then turn on the feature by clicking on the option box. In the case it was not able amendment to the option, select Change settings that are currently unavailable, and if emphasis was placed on the option request, press Yes, yes, and then activate the feature as normal. Then click Save changes button, you will activate the feature.